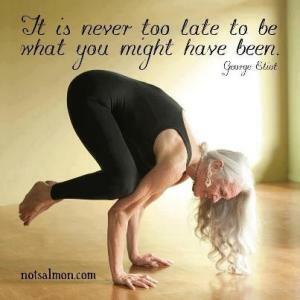 I admire older individuals who put aside their fears and considerations and come to yoga for the first time. These 50 to 80 year olds are what I call the ‘grey warriors’. By joining a class at this late stage, they are setting off on the adventure of a lifetime. It’s very likely that they will embrace yoga even more than younger students because they often have more at stake – repairing old injuries, helping medical conditions, and just loosening up. Here are a couple of posts that I’ve written to encourage seniors to take up yoga. This post appeared today on the Yoga Lunch Box and is entitled “The Well Seasoned Yogi”. And, here’s a link to the first of a series of four posts on the Yoga Anywhere site.